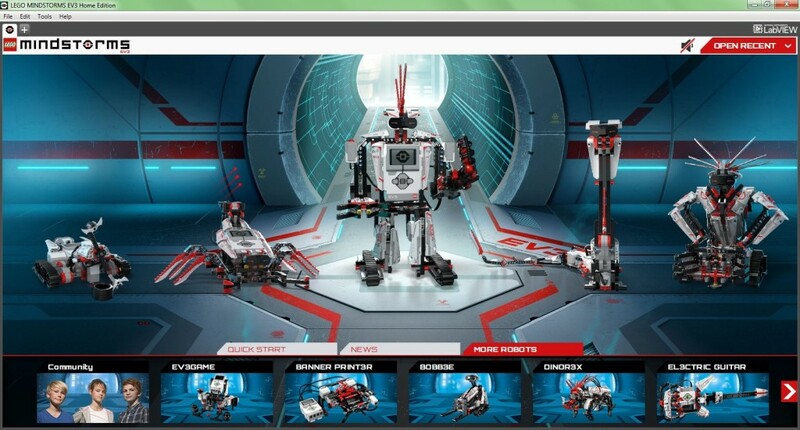 The LEGO Mindstorms EV3 31313 set comes with 17 models you can build, program and play with. 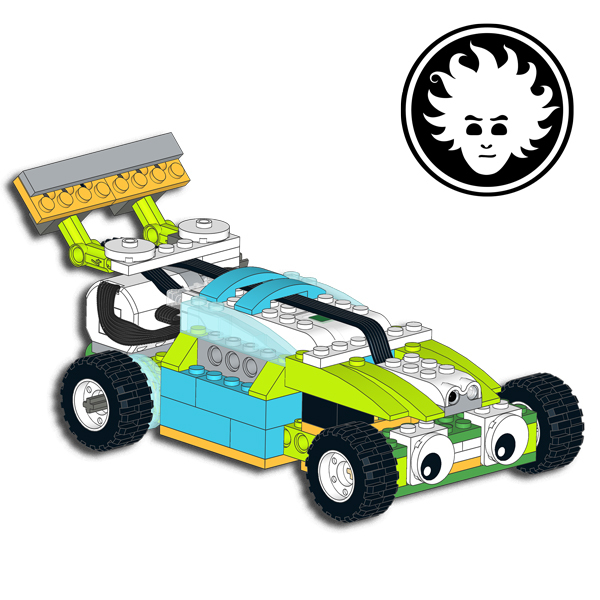 Yes, I know that the official models are just 5, but there are also 12 bonus models developed by the LEGO MINDSTORMS Experts Panel. 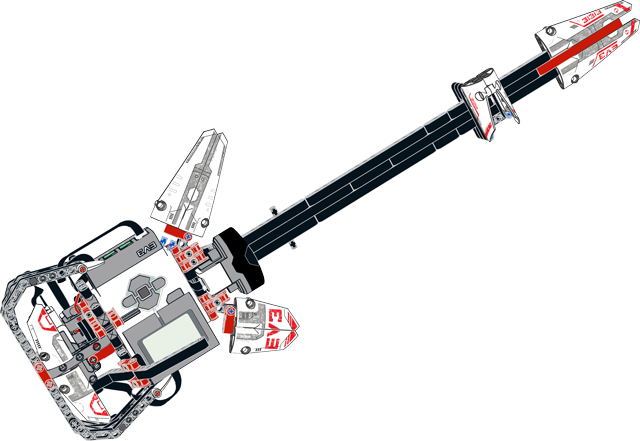 I am one of 12 people in the Panel, and the bonus model I made for you is the EL3CTRIC GUITAR, a LEGO guitar that you can play like a real one! 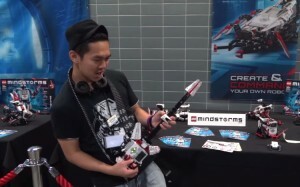 So you can make music with LEGO! You can find all the bonus models in the third tab of the EV3 Software Lobby named “More Robots”. Click on the image of the model, and you will see the building instructions and the program to make it work. 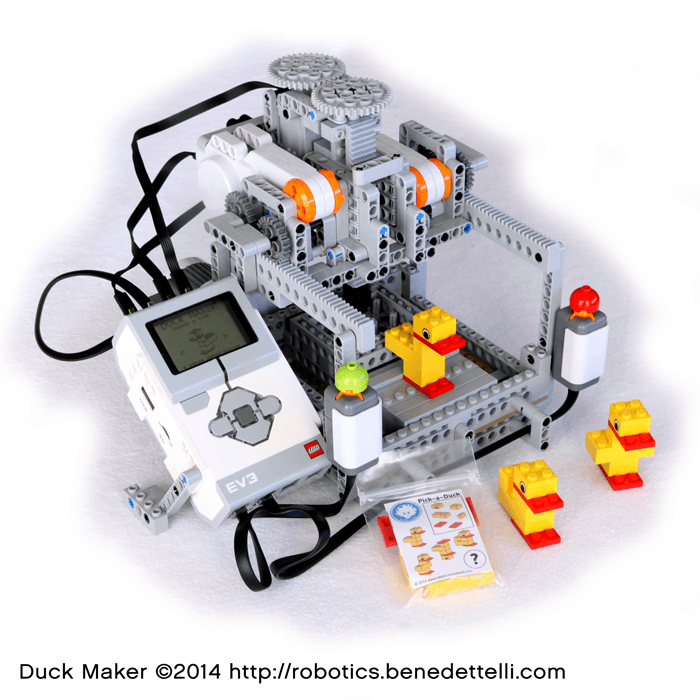 You can download the complete .EV3 project by clicking the button below. The idea of a working LEGO guitar is not completely new. Dave Parker published and demonstrated the NXT version 1 and NXT version 2 on his website NXTprograms. I improved the design to make the LEGO guitar looke like a real Fender® Stratocaster®, and adding a tremolo lever. You select which note to play by putting the index finger into the white slider, and sliding it along the neck. You don’t get a continuous changing pitch, you can select the notes of a E minor pentatonic scale. You can finely change the pitch of the notes by moving the tremolo lever. This reproduces the behavior of the vibrato system of a real electric guitar. My brother Alessandro is a professional guitarist. 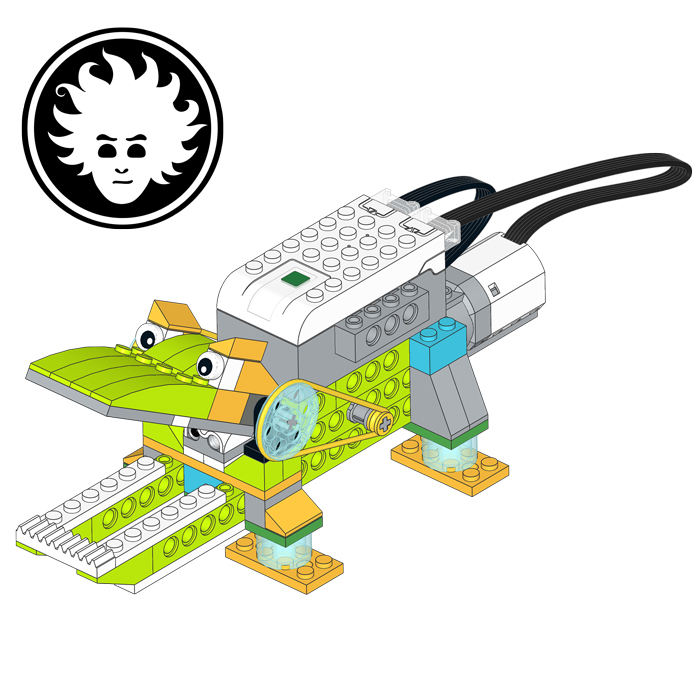 Since the first prototypes of my LEGO guitar, we wanted to make a real instrument out of it, but the sound quality of the EV3 brick made it sound just like “a squealing cat whose tail has been trapped into a door”. I never found the time to make it sound just like I wanted. The cool thing about open source projects like this, is having other people improve the initial idea. The Youtube user Dark Avenger has made a custom MIDI adapter for the LEGO guitar, to make it play beautiful and realistic sounds via a synthesizer. He used Arduino and a Bluetooth receiver. The EV3 sends Bluetooth messages to Arduino that implements a MIDI interface to the synthesizer. If you can understand Russian, you can enjoy the first part of the video below, otherwise, you can just skip to about 10 minutes, to hear the guitar solos and power chords. While I can play the piano, I can’t play the guitar. But I really enjoy posing to make cool photos of my creations! 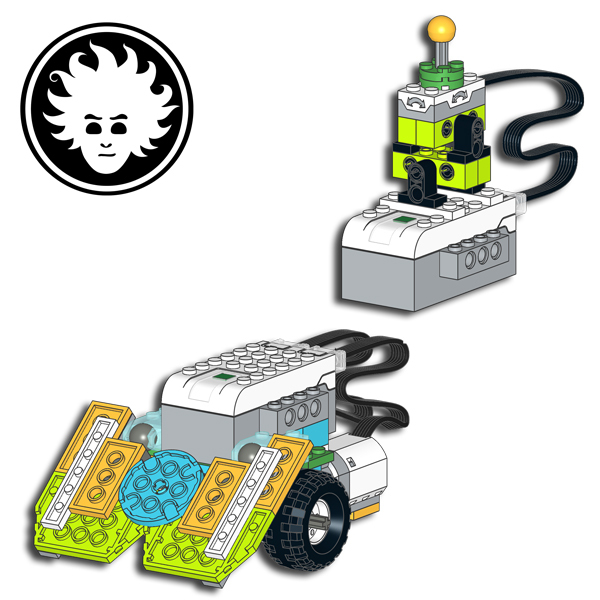 I was asked by the LEGO Group to make a very cool photo for the LEGO Club Magazine. 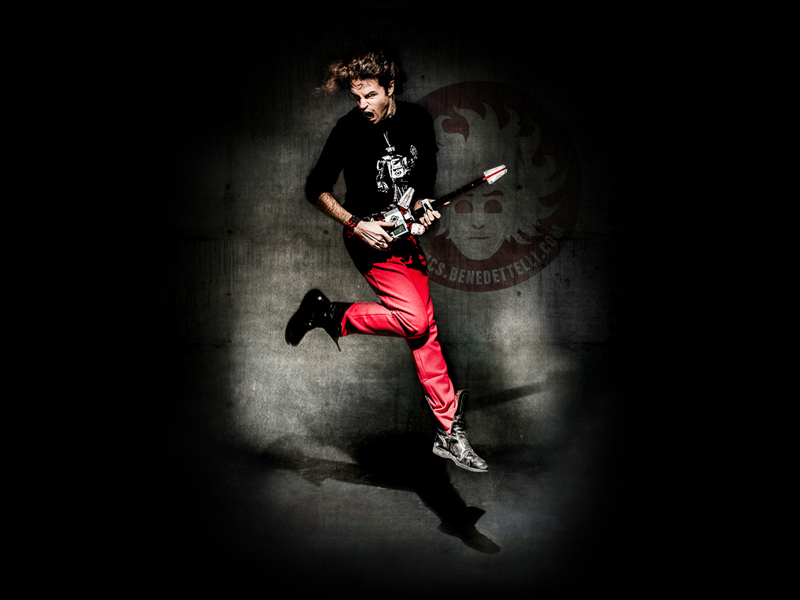 So I called my friend photographer Francesco Rossi for help, and we came up with this photo. To make it, I had to jump several times, almost risking to destroy my poor knees. 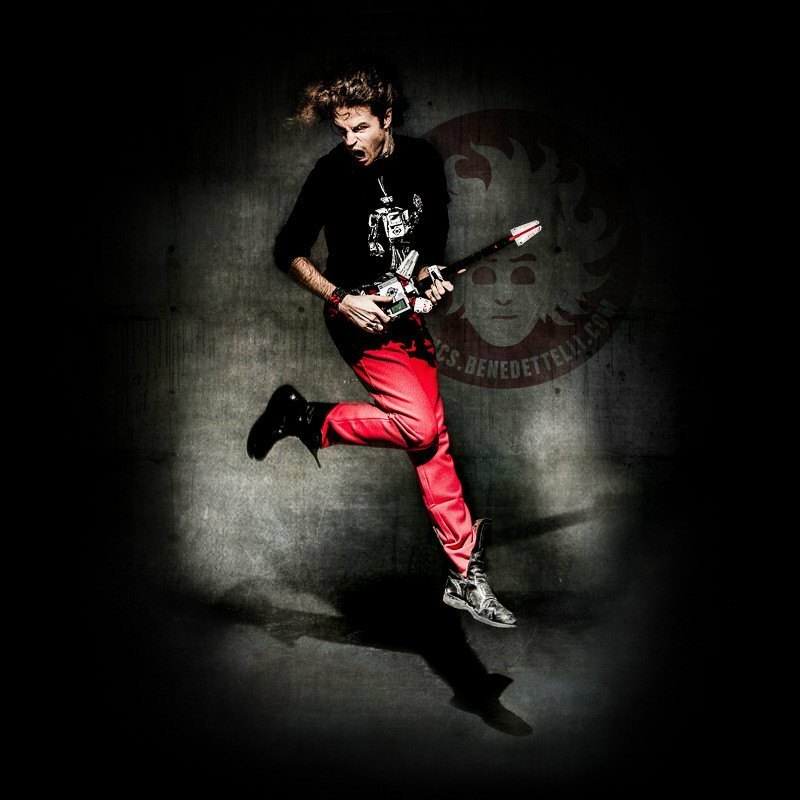 I’m not a real rockstar, and unfortunately… the photo never made it to the magazine, because it seems that my face is too scary for kids. Regarding the photos – they are super cool, but the Club team have asked if you have other images than the two you send us? Maybe some where you facial expression looks less scary (it’s kids and for the German market, they are a bit more conservative than we are). 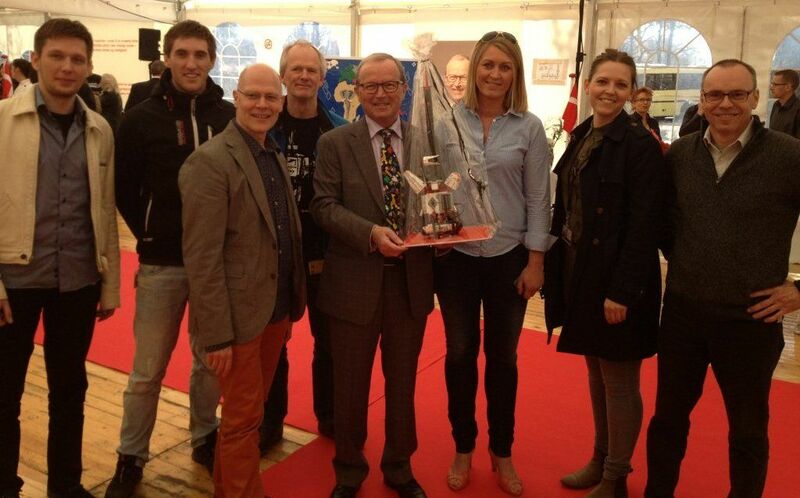 The LEGO guitar was chosen by the LEGO MINDSTORMS team as a gift for the LEGO Group owner‘s 40th anniversary working in the LEGO Group. 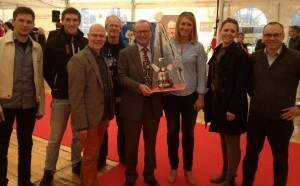 I wonder if he ever played it… LEGO MINDSTORMS Education designer Master Lee Magpili played it for sure instead!